So when I can’t quilt, I shop. I buy fabric whether I need them or not. And I love to visit quilt shops – even if only for a brief stop – just to check them out. In fact, brief stops are best because I do not buy as much as when I have time to stop and browse. Last week I had a chance to visit Quilting Quarters in Stockton. This week, the girl had a cheer competition in Sacramento and I was able to drop by Fabric Garden Quilt Shop in Sacramento. Lately I’ve been really interested in charm packs and layer cakes. I’m planning on making a disappearing nine patch crib quilt some time soon and I heard that charm packs and layer cakes help make that project a lot quicker. The few shops I’ve been too didn’t really have a good selection of those – at least not in the colors or fabric lines I want them in. 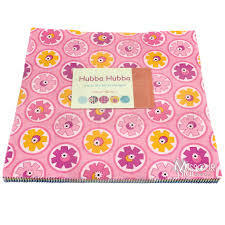 But I found what I was looking for at Fabric Garden quilt shop with the Hubba Hubba line from Me and My Sister Designs. I could have bought this online when I saw it originally but what’s the fun in that… okay, who am I kidding, that’s pretty fun too. 🙂 I enjoyed Fabric Garden. I had my kids and my nephew (3 kids under 13) so it had to be pretty quick. I sent them to Jamba Juice next door for a snack while I did a quick browse. They had a little bit of everything, which was nice and if they didn’t have the layer cake I found it wouldn’t have been hard to find yardage to buy. The staff were super nice and helpful. Next week I’ll be in Visalia, CA. If you know of any nice quilt shops I absolutely have to visit, please comment to let me know. How fun for you to be able to visit so many different quilt shops. Glad you were able to find the fabric you were looking for. Thank you so much dezertsuz! I’m going through the list this week and will create a mini shop hop for myself. The girl and I are heading down on Friday and then back up on Sunday so I’m hopping to be able to stop at whichever of these shops are on the way and around. 🙂 Now I’m looking forward to this weekend even more.